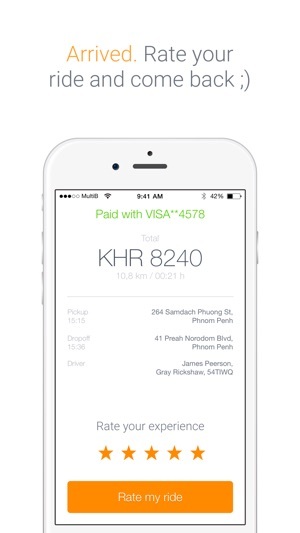 Passapp is the leading taxi-hiring service in Cambodia. 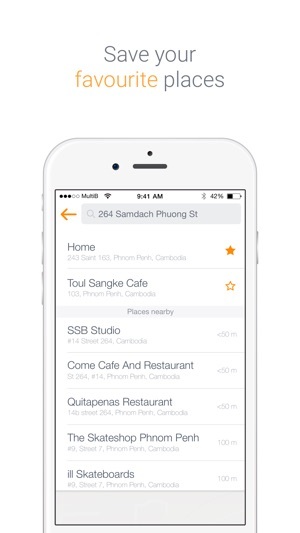 PassApp is a taxi booking service based in Phnom Penh, Cambodia. The application allows to book a cab, tuktuk, rickshaw with taximeter anytime we go for a flight to the airport or if we are running late for day job, or getting home late at night.. You are guaranteed to get there safely and always in time. We provide transportation in Phnom Penh at affordable prices only. PassApp intends to work with professional local drivers, adhering to the highest industry standards. That is what makes us proud to be a leading cab service in Cambodia. All you need to do is to pick your destination, choose a delivery point and submit payments after the trip is done. As simple as that! Using our service will help you book a taxi in a matter of seconds and get a fast go to any destination of your choice. To use PassApp, you should have an active mobile phone number at hand. 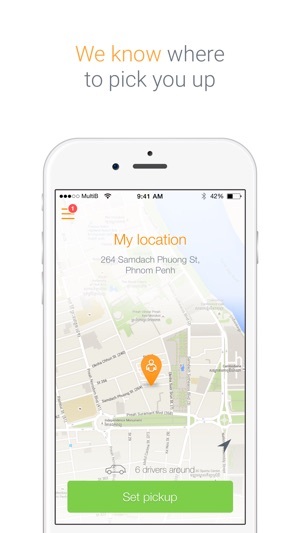 When your account is approved, you can mark your pick-up location and choose service type. 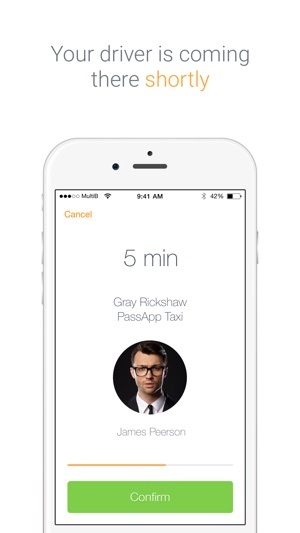 Once you have done a booking, the app will let you know when taxi driver arrives. After the payment is done, you will get the invoice with your trip details automatically sent to your inbox. We provide local taxi service at low prices. All tuktuk, rickshaw and cabs are owned by professional drivers who provide taxi service independently. - Got a planned trip and need to go fast to the airport to be in time for your flight? No worries! 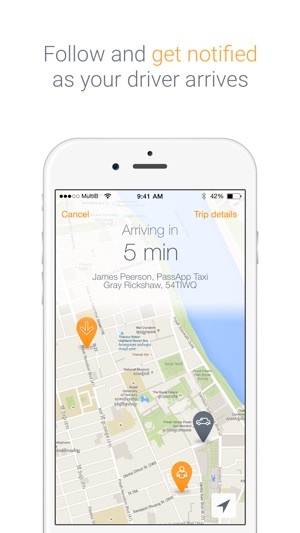 With advanced booking feature, you can pre-order taxi to arrive there at any time. - Rest assured you will always have access to fair estimates of your arrival time each time you grab a taxi. Our taximeter cab and tuk tuk in Phnom Penh are always at your disposal. - Rate your drivers helping us improve the quality and comfort of passengers rides. - Monitor the progress of your car on local map: from pickup location to delivery point. - Leaving notes to drivers before your taxi ride. This is especially convenient if you order a car for someone else or travel with pet wanting to warn your driver about it in advance. We go hand in hand with technology. That’s why PassApp Cambodia always uses up-to-date software to improve your lifestyle. Our 24/7 pass app allows to grab a ride anywhere fast and easily. Please do not hesitate to contact us, if you have any questions or concerns about our service. We are always glad to help and we are excited to hear what you have to say about us. 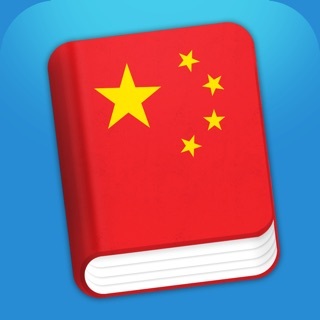 This will help us dramatically to enhance our Passapp and bring it to the next level. We go above and beyond in delivering excellent taxi service for all our clients. Being a leader on Cambodian market, PassApp taxi has surpassed its competition and become the leading Tuktuk & Rickshaw Booking App. So grab your chance to experience joy and comfort of everyday taxi trips with our best-in-class application. Drivers still try to con you. Today my driver went in the complete opposite direction of where the GPS told him to go, and then feigned ignorance when I pointed it out to him. So I ended up having to tell him how to get to my hotel, even though that’s his job. They’re still going to try to rip you off no matter what so when you book it, take a screen shot of that estimate and show them. For the rest of my stay, I’m just going to forgo the app and flag down drivers myself. This app is literally not worth standing and waiting for a driver when at any given point there’s at least 5 trying to offer you service. Just be savvy and don’t waste your time with this. Customers should really be able to rate their drivers as drivers can rate their passengers. This might make drivers cut down on trying to scam customers by taking them the long-way-around to rack up distance/time on the meter. We should be able to report drivers that do that or at the very least give them a rating. Going to try Grab app now to see if they provide that option. Once a driver stole $20 cash from my hands. No response to emails and calls. Today, driver drives in the wrong direction for 15 !minutes despite his map program telling him exactly where to go. I had to jump out and flag down a driver. Business meeting soon. These drivers have no idea how to use maps that tell them " turn left, turn right "- too complicated. Why hire ignorant , dishonest people? Failed business model.